The event will be held from 9 a.m. to 2 p.m. on October 28 at the Milo Bail Student Center on campus. Read more here. descriptions of all panel presentations and a list of exhibitors. Nebraskans for Solar will be among the exhibitors, which also include, in alphabetical order: American Energy Advisors, ChargePoint, DuTeau Chevrolet, Green Omaha Coalition, Nebraska Ethanol Board, OPPD, Prairie Homes, Inc,, Solar Heat and Electric, Thrasher and Transduction Technologies. Maintaining a tropical temperature for his turkeys, even through a Nebraska winter, used to cost Bill Bevans in the neighborhood of $60,000 annually. Not any longer. He estimates that he’s cut that bill in half since he became one of the first poultry farmers in the country to install a waste-heat recovery system developed by a researcher at the University of Missouri-Columbia. Offutt used to be a wholesale electricity customer and, more recently, has moved to a hybrid energy customer and customer delivery model. In the mid-2000s, the Department of Defense sold the majority of Offutt’s electrical distribution systems to OPPD and entered into a 50-year custom contract with the district. 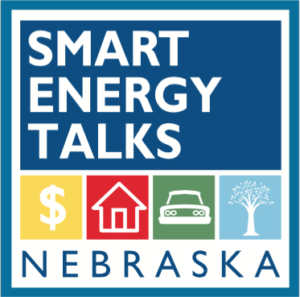 This entry was posted in Community Partners, Nebraska / Midwest News, NewsBlog and tagged 2017 Smart Energy Talks, community solar, Energy Storage News, Green Omaha Coalition, Nebraskans for Solar, renewable energy news on October 16, 2017 by Helen Deffenbacher.